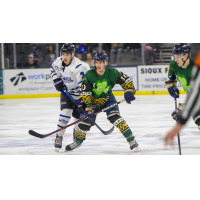 Sioux Falls, SD - For the third straight game the Herd rallied to force extra hockey, but for the third straight game the Herd came up on the wrong end of the scored. The Fargo Force outscored the Herd 3-2 in a three-round shootout to down the Sioux Falls Stampede 3-2 before 5,937 fans on St. Patrick's Day. Ryan Sullivan and Ethan Phillips scored goals for the Herd while Alec Calvaruso stopped 16 of 18 shots in goal for the Herd who moved into a second place tie with Waterloo with 71 points and 10 games remaining in the regular season. The Herd return home on Saturday to host Sioux City at 7:05 PM. It is also Stomp's Birthday Bash, presented by Dental Solutions. The first 1,000 fans will take home a limited-edition Stomp puck. Fans will have a chance to meet Stomp and get a photo with him during the game. Tickets are on sale now through the KELOLAND Box Office at the PREMIER Center.